I wonder if this recipe can be used to create a new Mauritian society as the current one has so many warts (according to me). Reginald Braithwaite comments: “[T]he negative folks are the most vocal, while the positive folks are trying […] instead of whining”. We should really focus on those real but overlooked problems in our country. One example is communalism. Of course, everyone agrees that communalism exists but so many of us think that it is a feature of Mauritius instead of being a problem. Another problem area is education. The world is now a knowledge society. And those with knowledge have power and wealth whereas those who don’t are modern slaves. Transforming our education system into something that is “world-class” will take 10 years at least and I’m not sure that we have that kind of time left. But we really should try. We should really stop wasting time with “problems” that are not really important. The best example I can think of at this time is the democratization of economy. As explained by Paul Graham, the pie fallacy is a fallacy! Mencius Moldbug points out that the world is full of “bureaucrats [who] build empires which churn out meaningless solutions to irrelevant problems”. 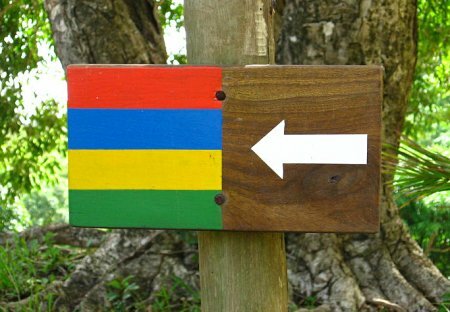 Happy 40th birthday to all of you, my dear fellow Mauritians. I know. I know. The state of football is not that great in Mauritius. And, to be frank, I don’t even know the names of the teams in the 1st division. What is the best Mauritian team? Which team has the largest number of supporters? 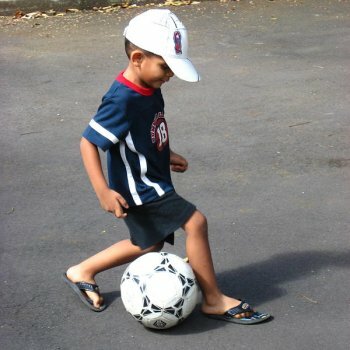 Who are the stars of Mauritian football? Who is the biggest star? What is the current Mauritian national team? Who are the national team players playing abroad? Who are those playing locally? What do you think of our chance to qualify for the 2010 African Cup of Nations? Can Mauritius beat Cape Verde? Anything else interesting about Mauritian football. Please feel free to comment. I will consolidate the information I get and send it to Piotr. I don’t know anything about current teams and players. The biggest star might (still) be Jean-Sébastien Bax. I think we have a chance to qualify for the second round of the ACN 2010 qualifications as one of the second best. We will get beaten by Cameroon (naturally) and beat both Cape Verde and Tanzania at home. We will also be beaten by Cameroon away and we will draw with both Cape Verde and Tanzania on their home soils. Christina and myself have embarked on a consultancy project which will last for about 6 weeks. 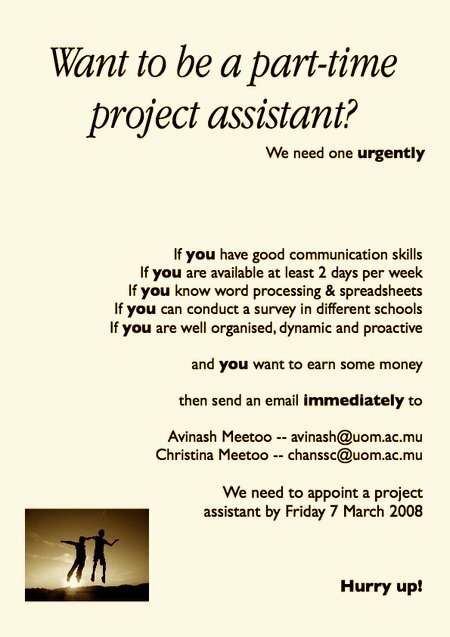 We urgently need a project assistant to assist us in doing some surveys in some schools and colleges and to analyze the results obtained. That person should preferably be a proactive and autonomous student of the University (we don’t really care about the year) who wants to earn some money. He/she will have to travel to the schools and colleges and will therefore have to be (more or less) free at least two days per week. We need to find someone by Friday so hurry up!